Several times we encounter a great and sophisticated web or desktop application that does not poses it's appropriate market share just for the reason of poorly written SETUP package and poorly designed deployment strategy. The fact is simple: If your users are not able to easily deploy your application then whatever sophistication or features you provide, they will be unable to even experience your application from the very first place! 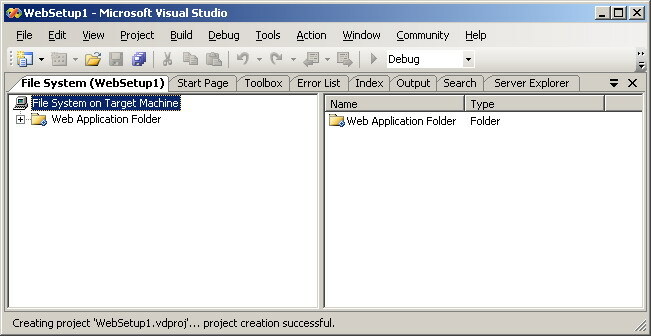 The most trivial technique is to simply copy your web application files to the production server hard drive and set a virtual directory there. The setting of a virtual directory is needed by several deployment schemes and can be achieved from Internet Information Manager Microsoft Management Consol (MMC snap-in). Because developers typically use the command line order 'XCOPY' to implement this technique, this technique is typically referred to as XCOPY Deployment. Copy Web Site is a new technique provided in ASP.NET 2.0 and Microsoft Visual Studio 2005 (Available from the Website / Copy Web Site... Menu option). Although this technique is performed from inside Visual Studio (in contrast with the XCOPY deployment technique which is performed from outside Visual Studio), there is no compilation performed at all. All your pages are still in their source code form on the production server. Some developers see this fact as a high risk on their intellectual property. Two extra disadvantages of this technique (and in fact any other technique that does not involve any compilation before deployment) are reduced error checking and the slow initial page load. The reduced error checking is a direct result to that no compilation is performed and hence some errors may be discovered by your users later. The initial page load slowness is also because nothing is compiled yet and the entire web application has to be compiled at the time the first page is being requested. 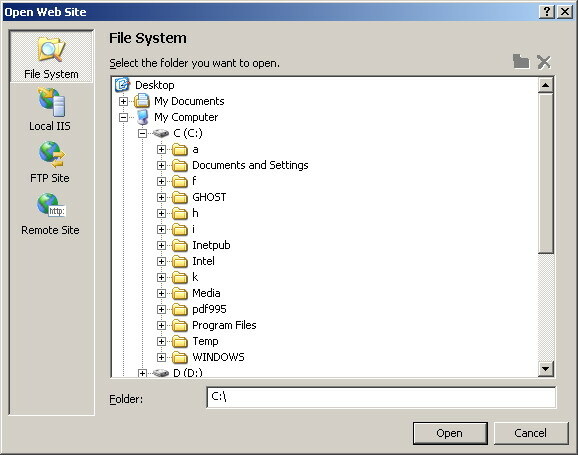 An advantage of this technique over the XCOPY deployment is that you have the options to deploy to the File System, the Local IIS, the FTP Sites, and the Remote Sites. Please see figure 1. All of the deployment methods we mentioned so far suffer from the fact of that no compilation is performed along with the disadvantages that comes as a direct result from this fact. To ensure fast page load and some protection of your source code, you should pre-compile your web site before deployment. Pre-compilation can be performed in-place by just adding '/Deployment/Precompile.axd' to the root URL of your web application and opening the resulting URL in Internet Explore. Pre-compilation can also be achieved using the command line compiler 'aspnet_compiler'. 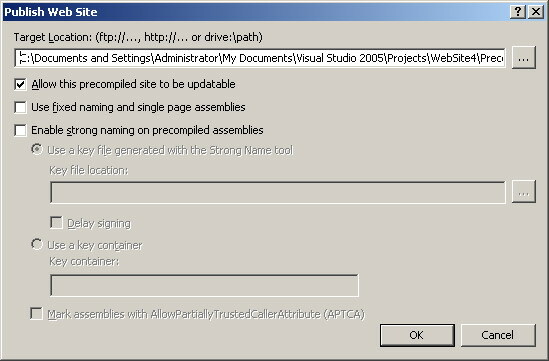 Using Microsoft Visual Studio 2005 you can still perform pre-compilation from the 'Build / Publish Web Site' menu command. Please see figure 2. First of all you need to know that our target is to create a package (and MSI file) that contain our web application in a form that can be later easily deployed on the final production server. Let's start by selecting 'File / New / Project' in Microsoft Visual Studio 2005. This will present you the famous set of possible project types from which you will select 'Other Project Types / Setup and Deployment' then you will select the 'Web Setup Project' icon from the side to the right. See figure 3. 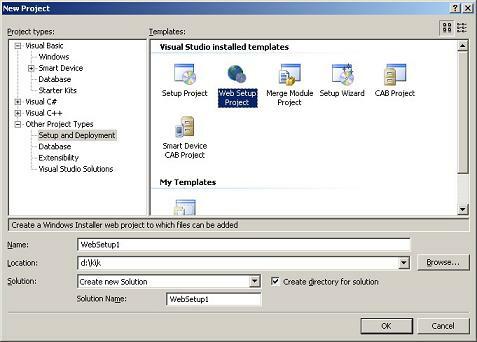 In figure 3, set the appropriate project name and folder options then click OK.
You can always have the same behavior by adding the SETUP project above to your web application solution instead of creating a new separate solution. You can achieve this by selecting 'File / Add / New Project' instead of 'File / New / Project'. This way you will have a self contained web solution. The 'File / Add / New Project' method is much more recommended. You will then need to add your web application files to the SETUP project we are developing now. 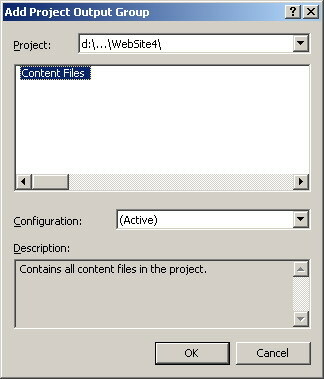 This can be achieved by right clicking your SETUP project name in solution explorer and selecting 'Add / Project Output'. Please see figure 5. Author, Description, Manufacturer, ManufacturerUrl, ProductName, Subject, Title, and Version Use all of these properties to identify / describe your application and yourself. AddRemoveProgramsIcon Here you can specify the icon to be displayed beside your application in Windows Control Panel's Add Remove Programs. DetectNewerInstalledVersion Specify here whether or not a check is to be performed to determine the existence of a new version already installed of your web application. RemovePreviousVersions Specify here whether you need an older version of your web application to be removed if a newer version is being installed. 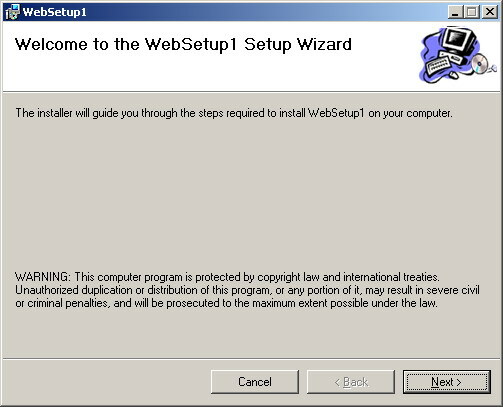 RestartWWWService Some web applications requires the Internet Information Service to be stopped and then restarted after the deployment of the application. Use this property to control such behavior. The last and most important step is to actually build our SETUP project. This cane be achieved by right clicking the name of our SETUP project in the solution explorer. It's this specific step that creates the MSI package / file mentioned above. This is the file you will need to distribute to your users and this is the file they will use to deploy the web application on their production server. It's worth mentioning that the actual deployment process will be some what similar to the SETUP of any typical desktop application (with some exceptions of course). One of the many similarities is that the web application after deployment will automatically appear in the 'Add / Remove Programs' window of Windows Control Panel. You must know that every of your .NET products, web application or ASP.NET custom control, can be easily decompiled. Practically every user can get your source code by using some free .Net decompiler. If your license doesn't include source code it is not enough to just exclude source code files from installation. You need additional protection. After long analyze, we decided to use Spices.Net for protection of all products of Bean Software. Even if you can't afford complete suite, consider at least their Obfuscator. Later, I discovered .NET Reactor which also looks good and it is about ten times cheaper :). You can check Product Comparison link on NetReactor site where it is compared to some other products, it looks really impressive, and not only in price issue.